1- What percent of everything under the “sun and moon” did we capture in terms of our coverage of the outputs, tasks, and enabling knowledge and skills within our project’s scope? 2- What percent of everything critical, and not just necessary, did we capture in terms of our coverage of the outputs, tasks, and enabling knowledge and skills within our project’s scope? 3- What did you personally think of the product we produced? The content of both the Performance Model charts and the Knowledge/Skill Matrix charts? 4- What did you think of the process we employed to produce the Performance Model charts and the Knowledge/Skill Matrix charts? 5- What do you see as the key issues going forward for our Project Steering Team to address? All good facilitators have their own personal version of the above, and there are many versions and variations on those themes that may be apropos in a particular situation. Timing is everything, as it is said. Great facilitators have a great sense of timing. If portions of the debriefing process have to be done early by the group because the team just really needs to talk something out¾let them or help them. But get on with it. Don’t get so bogged down by your process script that you can’t deviate from it upon occasion – especially when the occasion seems to call for it. We’re not saying this is always easy. It isn’t. When it’s time to debrief, debrief. Make sure the team has had a recent break. Offer them a five- or ten-minute break before starting the debrief. Let them know that the debriefing may take 20 to 40 minutes. I go to the flip chart and on a blank page I frame my first two questions so that everyone can read my words rather than try to remember what I said. Remember . . . try to make it visible. I ask them to write their answers down on a piece of paper in front of them. Too often I have sensed that members who did not write down their answers changed them as we went around the table asking for their numbers. Ah, group think/peer pressure at work. So now I ask everyone to write down their scores, and then I go around the room systematically and get each set of numbers. I write them as they call them out. I also tell them in advance that no one will have to explain their numbers to anyone else in the group. In fact I’ll cut off the discussion, because the point of this little exercise is to get the individual feelings of each group member out as to how well we did, not to arrive at consensus percentages. Once I’ve gone around the room gathering each set of numbers, I thank them for their inputs and feedback and then try to move quickly on to the next three questions. But often enough, someone will ask someone else to explain himself or herself regarding the numbers they gave. Even if I try to control this I can’t always do so. And sometimes the one individual who is being challenged or questioned wants to tell everyone why they feel the way they do. I usually let them do so and let the dialogue go. I also know that if I listen real closely to what is being said, I just might learn something germane to my assignment of facilitating the team to produce the proscribed outputs. It’s never too late, even at the debriefing stage. If this conversation will give me insights to what the team and I have produced, great! If this helps me figure out where the holes or burning issues are within the context of all of my organized data, great. I win for I can now get it fixed sooner rather than later. The goal of the team debriefing is to get their feelings out on the table so that you, the facilitator, know where they stand on the completeness and accuracy of what you collectively have produced; otherwise, how would you know? At the end of most of my analysis and design meetings, I almost never have a real good, personal feeling for the total, overall accuracy and completeness of the products of my process facilitation and the team’s content contributions. After all, I only own “the process” and they “own the content.” I need to ask them about the content. They would know. I shouldn’t be expected to know. Next, to get some words around those percentages, I write the next three questions on a flip chart page and post it for team reference as we conduct this next round. What did you personally think of the product we produced? The content of both the Performance Model charts and the Knowledge/Skill Matrix charts? Or the content of the design? What did you think of the process we employed to produce the Performance Model charts and the Knowledge/Skill Matrix charts? Or the content of the design? I tell everyone that they can respond to all three questions, two, or one, or they may pass as they wish. I also tell the group that I intend to go around the room systematically to give everyone a chance to have their say, without being cut off or distracted by others’ questions, challenges, agreements, etc. And I tell them if they’d like to add or rephrase their captured quote, then they may do so after we’ve made the first round. 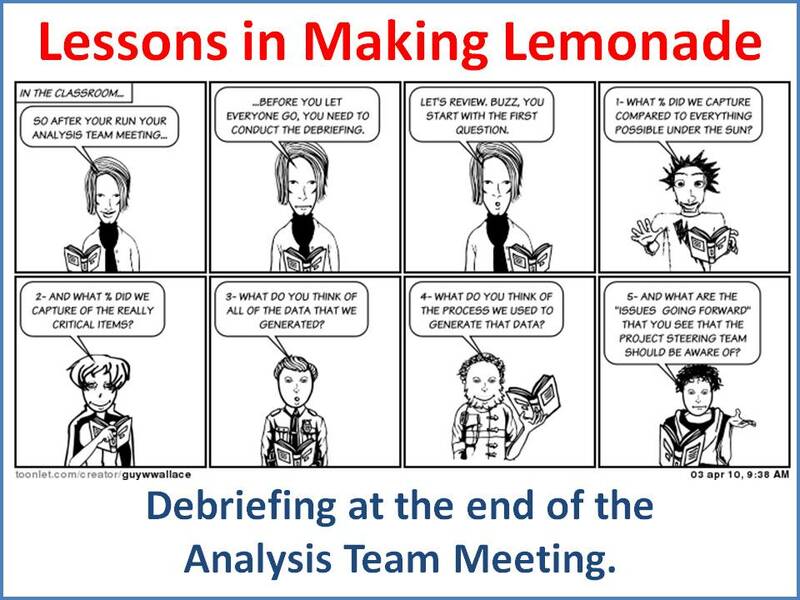 In a PACT analysis or design meeting, the debriefings are used to help those of us without extensive performance or content knowledge understand where we are in terms of our analysis data – or the design’s – completeness, accuracy, and appropriateness. Control what you can in the meeting. Learn what you can and cannot control. And debrief in a flexible, yet structured manner so that you get what you are looking for, and not just what they happen to give you. And be open for other debriefing means to these targeted ends.